Your customers can be online at any time, so your brand needs to be online all the time. A successful B2B media strategy begins by determining what parts of the digital ecosystem your customers frequent, followed by crafting content that delivers results. An always-on strategy finds where your customers consume information, then targets them with a strategic mix of paid search, display advertising, paid social media and content marketing. Spend and they will come. Symmetri works with SGK, Inc. to ensure their paid media efforts deliver consistent exposure each month for each of SGK’s brands and services. Remarketing display advertising is reaching potential customers who have shown interest in one of the four sub-brands. Social media advertising offers direct links to influential targets. 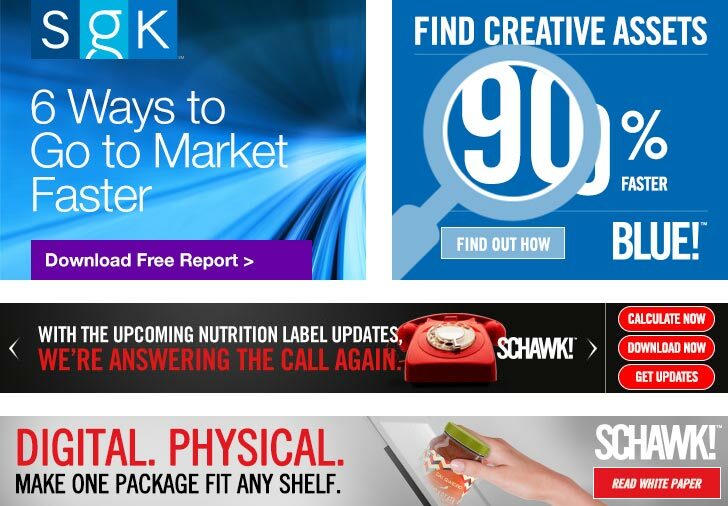 And new advances in technology allow SGK’s brand, Schawk, to use interactive paid media to target three audiences with distinct calls-to-action within a single display ad. For SGK's sub-brand, BLUE, paid search campaigns drove 1.65 million impressions, 45,000 clicks and 212 "contact us" leads within a year. Using ad copy strategies such as keyword insertion, the top performing ad drove a 15.26% click-through rate. And optimization techniques kept the overall cost-per-click under $1.50 despite use of highly competitive terms.